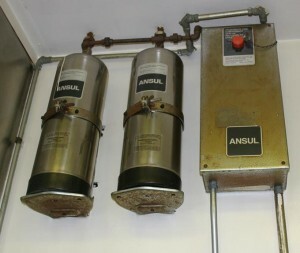 Flue Steam will make sure your automatic fire suppression system is code-compliant. Automatic fire suppression systems are a must-have safety feature for all commercial kitchens. They are easy to use in an emergency, but they’re not so easy to install. Many different state and federal codes apply to these systems, and it can be challenging to keep all the details straight. Fortunately, when you trust Flue Steam as your automatic fire suppression system installation company, we make sure your system is UL-300 compliant. Automatic fire suppression systems are designed to automatically detect and extinguish grease fires that ignite on your cooking equipment or inside your exhaust hood. This prevents the fire from spreading deep into the exhaust system and causing serious damage and danger. Automatic fire suppression systems are required to meet certain system requirements in order to be code-compliant. For example, they have to have key parts like a temperature sensor, an extinguishing agent, an automatic gas shut off valve, and a manual trigger. Each commercial cooking appliance that may produce vaporized grease and hence pose a fire hazard must have its own separate nozzle for dispensing the extinguishing agent. This extinguishing agent should be a wet chemical agent that is approved for use in fighting grease fires. Additionally, the system is required to have one alarm that will notify employees of fire and another alarm that will tell employees that the system is discharging. 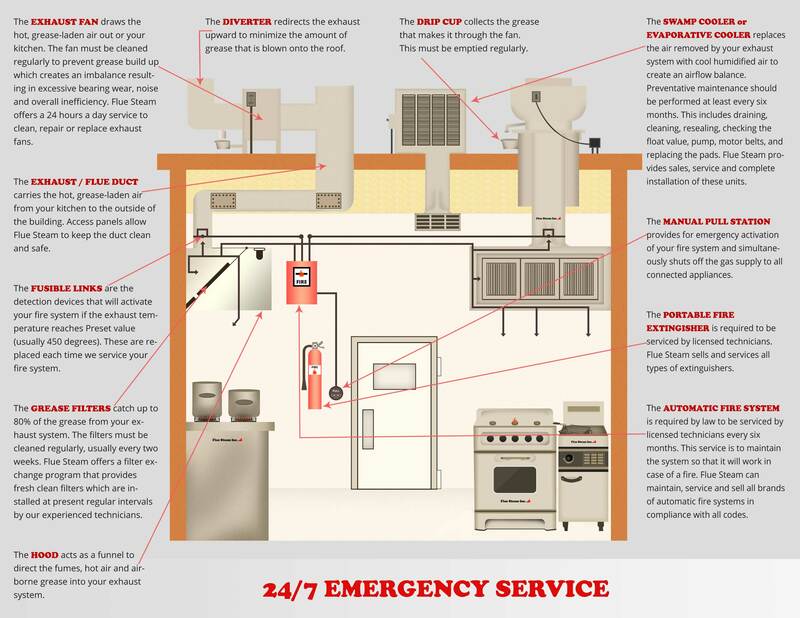 As a highly experienced automatic fire suppression system installation company, Flue Steam can make sure your system meets all these necessary requirements. When it comes to installing your system, there are still more code regulations to follow. For example, the manual trigger for the system has to be installed near an exit but no more than 20 feet from the exhaust system. Because Flue Steam has the C-16 license required by the state of California to work on automatic fire suppression systems, you can count on us to make sure every aspect of the installation is done perfectly. After installation, your automatic fire suppression system will require bi-annual inspections. You’ll also need an extra inspection after every discharge of the system in order to ensure that it has been reset properly and is ready for the next emergency. Who better to provide these inspections than your original automatic fire suppression installation company? We know exactly how the system is supposed to be set up and we can correct any issues that may be discovered during an inspection.